Paddy Reilly’s 25th Anniversary Concert April 30th! Paddy Reilly’s Bar is 25 years old this year, and they have been celebrating that through April. The culminating concert features Black 47, who found their feet playing there and also brought the bar to national attention (it’s one reason the bar still gets a lot of international tourists). Steve Duggan of Paddy Reilly’s told me on the podcast (which is yes almost a week late, sorry! holidays! Tribeca Film Festival!) that there might not be a bar at all if not for Black 47— and the same goes for them. Both Steve and Larry Kirwan, founder of the band, talked to us on this week’s podcast. I love this bar– it’s one of the first sessions I ever went to in New York; I think Liz Carroll was in town and playing. It’s an all-Guinness draft bar (they pour a nice pint!). I even was a guest judge on a Karaoke night last summer. Mike Farragher, who also chats with us (and whose book This Is Your Brain on Shamrocks was reviewed by Michelle Woods, who reports in too), wrote a lovely piece for the Irish Voice. Here’s the beginning of it– read the rest on their site! Let me join the cast of thousands in toasting the crowd at Paddy Reilly’s on Second Avenue in New York for an amazing 25 years of serving nothing but Guinness on tap, and nothing but the best in Irish music! The venue has been hosting a number of celebrations to mark the date in 1986 when the famed Irish balladeer opened the place up and hung his name on it. Black 47 will make a return to the bar on April 30 to pay tribute to the place where it all started for them. Wow. I wish I had this 25 years ago, when I wasn’t quite legal and desperate to get inside the doors of the place! Security was tight, which added to the mystique — the entertainment inside might have consisted of an old banjo player passing gas, but when you were stuck on the outside with a line full of people thirsty for a pint lining around the block, the mystique about what you were missing inside made it the hot spot of Manhattan. Of course, a second-rate banjo player would never be allowed to ply his trade on this sacred ground. Paddy Reilly’s was the launching pad for the best and brightest musicians of our culture. Black 47, the Prodigals and the Mickey Finns are just some of the artists that have been launched by the venerable bar. 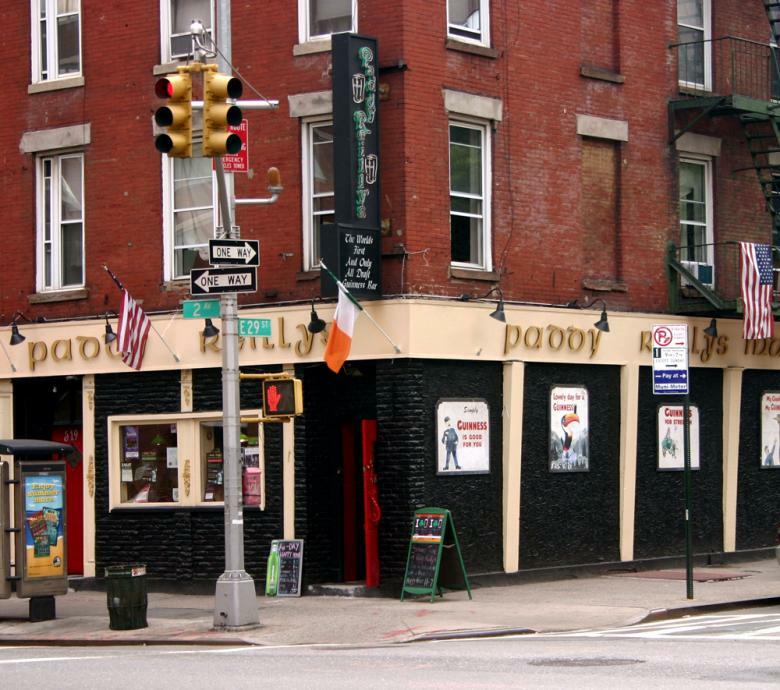 How It’s New York: Paddy Reilly’s is a New York fixture. Tourists come! Great Irish music, but also bluegrass, karaoke, book readings. How It’s Irish: Named for an Irish balladeer, it has Irish music and sessions.